"Sampath Speaking" - the thoughts of an Insurer from Thiruvallikkeni: the new Hope of leg spin ~ England skittled out !! the new Hope of leg spin ~ England skittled out !! Remember that Chepauk Test in Sep 1979 – Aussies captained by Kim Hughes (wicket keeper was Kevin John Wright) played Sunil Gavaskar led Indians. Dilip Doshi making his debut at age 32 and taking 6 wickets was overshadowed by a leg spinner Jim Higgs who had figures of 7/143. After a significant amount of pre-series talk about securing a first ever Test series win on South African soil, the results have been abysmal. The bowlers have performed well – it started in the first morning at 12/3 – but the fielders and the batters have left Indian team down. Starting with the loss at Centurion, there has been lot of disappointment. In the 2nd test, the keeper failed and there was poor running too. The venue now shifts to – Johannesburg, the largest city in South Africa and is one of the 50 largest urban areas in the world. It is the provincial capital and largest city in Gauteng, which is the wealthiest province in South Africa. Johannesburg is not one of South Africa's three capital cities, it is the seat of the Constitutional Court. The city was established in 1886 following the discovery of gold on what had been a farm. Howsoever rich it could be, the city is reeling under water shortage. They call it - level 1 water restrictions in the city since being effected in March last year‚ despite the province having enjoyed some rain this summer. There have been repeated requests for the Johannesburg residents to reduce their water consumption patterns as water usage has increased at an alarming rate and this is of serious concern given the recent heatwave we have been experiencing since the beginning of 2018 in Gauteng. Many weak Indian teams have come to South Africa since the first tour in 1992-93, and none has been whitewashed. This team landed as a "strong" team, but now needs to do something special to avoid a whitewash. If there is any consolation, they are making this attempt at the Wanderers, where they won a World T20 final and also brought up their first Test win in this country. India have played four Tests at this venue, and have never lost. Statistics are statistics, you can add some more or just bury them ! Besides Higgs, there have been some classy leg spinners from the land of Australia dating back to : Bill O'Reilly, Clarrie Grimmett, Richie Benaud, Bob Holland, Shane Warne, Stuart McGill, Adam Zampa and perhaps this teenager would one day fill up the shoes more than amply – he is Lloyd Hope, the new sensation. For long the best performance in a limited overs match was the unheralded Winston Davis who took 7 for 51 in that Prudential World Cup 1983. In the 7th match of 1983 WC in June 1983, West Indies made 252/9 and that spell of Davis bundled out Aussies for 151. 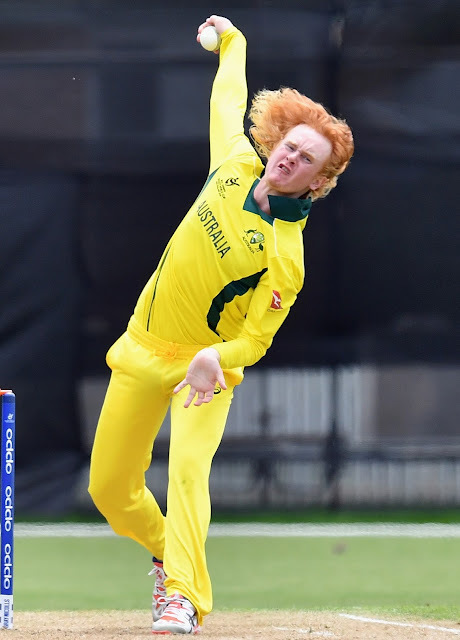 Today in the U19 WC in New Zealand, the Adelaide teenager with the flowing red locks, dubbed the Wizard by his teammates, is being compared with the legendary Shane Warne breaking South African hearts. The batting was not that great – they made just 127 – when Jason Sangha calls for "Wizard" to bowl the sixth over of the innings, England only need a further 99 runs to eliminate Australia from the Under-19 World Cup. The match is being watched by a handful of spectators in Queenstown, and a few thousand on television across the Tasman - word of the Australians being bowled out for 127 cannot have encouraged too many to tune in. The first wicket fell at 47 in 7.3- then the tale : 2-47; 3-51; 4-71; 5-79; 6-72; 7-82; 8-84; 9-96 and all out for 96. Pope had figures of 9.4-2-35-8 in that dream spell. Pope's spell was the best-ever in the ICC U-19 Cricket World Cup to date, bettering his team-mate Jason Ralston's seven for 15 against Papua New Guinea earlier. Getting back to that Winston Davis 7 for : Lankan Chaminda Vaas took 8/19 against Zimbabwe in Dec 2001. Others to have taken 7 wickets in ODI after Davis are : Shahid Afridi, Glenn Mcgrath, Rashid Khan, Andy Bichel, Muthiah Muralitharan, Tim Southee, Trent Boult, Waqar Younis, Aaqib Javed & Imran Tahir. ~ and today Aussies successfully dfended 128 with the spin of Pope, skittling out England for 96. Captain Jason Sangha's swift reflexes and catching at slip accounted for the big wicket of opener Tom Banton after he had raced to a 53-ball 58, eating away more than a third of the target before the lunch break. Hope’s spell is reminisced with that of Shane Warne's match-turning spell in the 1999 World Cup semi-final against South Africa. A fired-up Pope passionately and vocally urged his teammates on during his initial three-wicket burst, despite England still being in a strong position given they were chasing such a low total. The 18-year-old finished the job as the Australians progressed to the final four amid jubilant celebrations. They will now face either New Zealand or Afghanistan in the semi-finals.